Selling over 500,000 dictionary apps * More than 24,000 translation pairs * High quality English speech engine (via In-App Purchase) * Integrated Google/Bing Translate * Phrases & Synonyms * No internet connection required (except Google/Bing Translate & Wiki search) BitKnights makes quality apps for people who love or use languages. That's why we have been developing this app for 7 years now, and will continue to do so in the future. Our Esperanto English Dictionary is an easy to use, lightning fast, user friendly dictionary with a huge database. This universal app will run on iPad, iPhone, and iPod Touch, so you only have to purchase it once and you can install it onto all of your devices. Features: - More than 24,000 translation pairs - Automatic language detection in search mode - Accentuation independent search - Quick search in browse mode: jumping to the right part of the dictionary while typing - Detailed view of the chosen word with phrases and synonyms - Word linking in detailed view: clicking on any word will show the word in a new detailed view - Speech in detailed view: clicking on any word will pronounce you the selected word or phrase (High quality English speech via In-App Purchase) - Copy in detailed view: long tapping on any word will copy the word or phrase - English synonyms (via In-App Purchase) - Integrated Google and Bing Translate (Internet connection is required!) - Integrated Wiki search (Internet connection is required!) - History of dictionary and translator lookups - Favorites: you can add or remove words - Settings with color schemes, icons and night mode If you like our app, please review it. Does not have a very large list of words. But with a understanding of how Esperanto words are constructed, it is often possible to deconstruct a compound word and figure out the likely meaning. This dictionary is still a good resource for on the go. My go to Esperanto dictionary. Dankon, developers! The available features are a little misleading; you can buy English audio, but tapping on an Esperanto word brings up a message about there being no audio. I'd rate this app higher if that option became available. Other than that, though, the amount of vocabulary is amazing, and the other features work just fine. 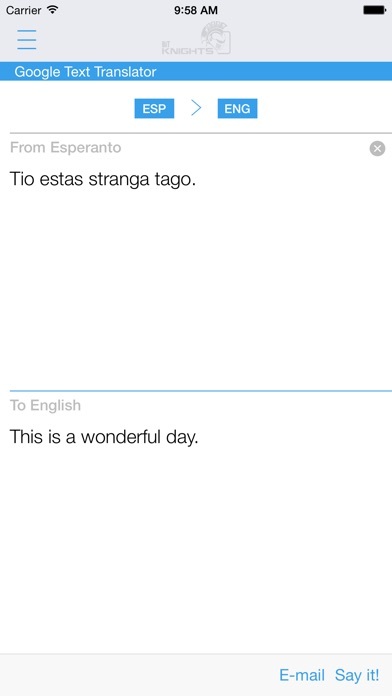 It does everything it promises, to the utmost, I just wish it could pronounce esperanto words along with the English. I bought this for the pronunciation but to hear it costs extra as I found out too late. 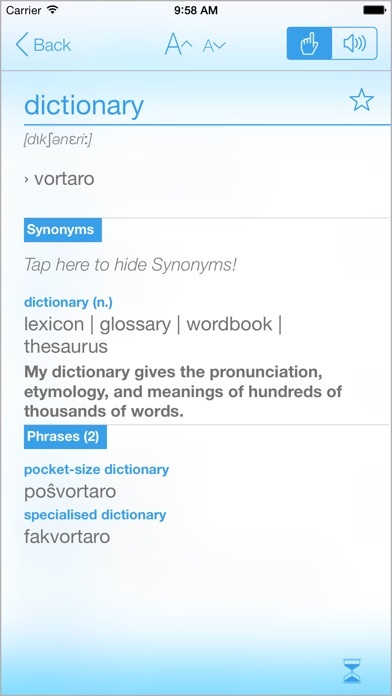 There are two big Esperanto dictionaries available on the App store. This one edges out the other, but only by its features. I’m compared the two dictionaries and I suspect that they even be built from the same word list. Certainly when I looked up words in both, I found the word in both or neither. I also checked the Esperanto, one of the words was there, though not with this perfectly reasonable English translation. Both have the problem of not specifying which English meaning applies (kofro is a trunk you put things in, so the word isn’t helpful if you want to specify the trunk of a tree or a person). I also noticed that both dictionaries have some words out of order. This one, for example puts “maco” after “maĉo,” when it should be before. The ability to send an list of words you looked up is helpful for those who want to remember future words to study (although I was not able to get this to work on my iPhone, just my iPad). The major update I would suggest for this app is a larger word list. 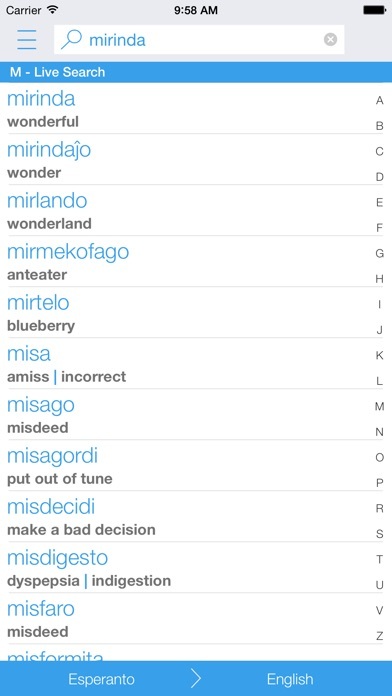 If I knew that there was little reason to get my Esperanto/English dictionary off the shelf when my iPhone or iPad were at hand, this would be five stars. Instead, its well-executed features puts it barely into the four star category. I should not be able to quickly make a list of a dozen words not to be found in either dictionary but which can be found in John C. Well’s English-Esperanto dictionary. Dictionary data could still use a bit more depth, but it is pretty good for what it is. Consider adding more technology / science terms, like software, or mononucleosis. Another thing I'd like to see is the ability to define a word using the phone's dictionary, or even copy it (since whenever I try to do either, it speaks/translates what I touch instead). And I still hope for an Esperanto voice option someday. :) Regardless, I use this app all of the time and would be very lost and sad without it! This is a very useful resource; one that I am using on a daily basis. Highly recommended! / Cxi tiu estas tre utila rimedo, tiu mi uzas cxi-tage. Mi tre rekomendas gxin! Amazing App 💚 Tre Bona!! I've been wanting an EN-EO dictionary for a while, but was wary of spending the money. I am so glad I did. This app is fast and has loads of words. The quick reference to Wikipedia is a great tool also. Totally worth the money.